What is an event? An event is an occurrence, usually a special occasion. It can be either “a thing that just happens”; or a “planned social or public occasion”. An event is not always planned, but in the world of event management, the more planning that goes into an event, the smoother the event will run. Organising an event requires understanding of the basic fundamentals and variables associated with an event. With 120 pages, this comprehensive ebook on Event Management will guide the reader through the complexities and considerations for managing and organising an event. 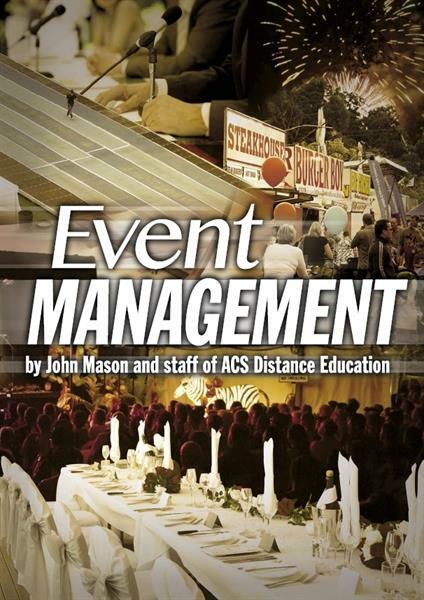 Written by John Mason and staff of ACS Distance Education, Event Management will provide you with a great foundation on managing a whole range of events. What is an event worth? What makes someone a good event manager? If you are interested in studying Events Management, ACS Distance Education has an Events Management course.